The Young Professionals Initiative (YPI) is holding an event for the APC Lagos State gubernatorial candidate, Mr. Akinwunmi Ambode. 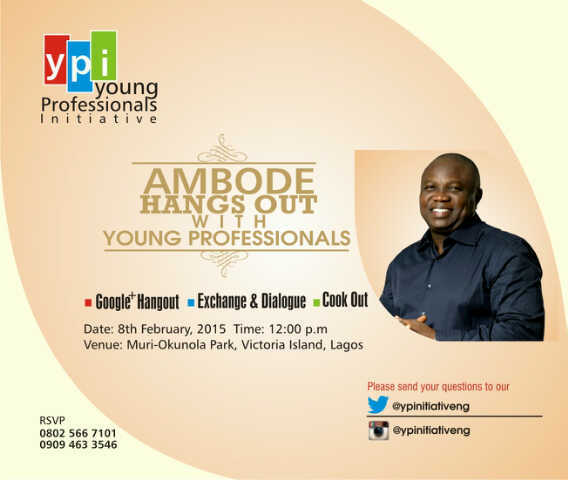 The event termed ‘Ambode Hangsout with Young Professionals’ provides an opportunity for like-minded young professionals in Lagos to gather, network and have an interactive exchange and dialogue with the candidate through a Google+ Hangout and a Cookout. YPI is a diverse group of young professionals who have come together to organize, brainstorm, and clearly define what motivates them to actively participate in politics in Nigeria. Their mission is to build a movement by organizing and mobilizing this key voter demographic as political stakeholders.